WASHINGTON — Elizabeth Warren announced Friday that she will seek a second term as senator from Massachusetts, giving battered liberals a rallying point as Donald Trump prepares to assume the presidency. “I am running for re-election in Massachusetts in 2018,” she wrote in an e-mail to her network of supporters. Warren suggested that Trump’s unexpected victory was among the factors that swayed her. “Trump has made the fight for working families a lot harder and more urgent,” she said, when asked if Trump’s White House win had influenced her decision. “I feel so strongly about the need to be in Washington and fight to protect the things that we have built, fighting Trump’s dangerous Cabinet appointments,” she said, pointing to Trump’s pick of Tom Price, a Republican congressman from Georgia, to lead the Department of Health and Human Services as one example. Price, she said, wants to privatize Medicare, which would hurt the 1.2 million Massachusetts residents who receive health benefits under the government program. Warren is a member of the Senate Health, Education, Labor and Pensions Committee which will hold a confirmation hearing on Price later this month. She also vowed to fight Republican efforts to repeal the Affordable Care Act, weaken post-crisis financial laws, and defang Warren’s brainchild — the Consumer Financial Protection Bureau. Republicans wasted no time in engaging in the reelection fight, seizing on Warren’s stand against a bipartisan bill aimed at spurring medical innovation that included $1 billion to help states combat the opioid crisis. Warren said the legislation, which President Obama signed into law late last year, gave away too much to pharmaceutical companies and did not provide enough funding for medical research. Before Trump’s surprise victory, Massachusetts political circles swirled with speculation that Warren might not seek reelection. Many looked at Massachusetts Representative Joe Kennedy III as a likely contender to succeed Warren, along with several other House members and state figures. “Right after the election, everybody has really rethought everything,” said Democratic strategist Mary Anne Marsh. Warren has remained popular in Massachusetts but could face a challenge from Curt Schilling, the former Red Sox pitcher turned conservative firebrand who has said he plans a Republican bid. Requests sent to Schilling for comment were not answered. Warren last year had been floated as a possible vice presidential nominee, and she could have fit in Hillary Clinton’s Cabinet had the Democratic nominee won. Some Democrats have speculated she would run for president in 2020, something that running for reelection to the Senate wouldn’t necessarily preclude her from doing. Warren recently landed a spot on the powerful Senate Armed Services Committee, a high-profile perch that will allow her to help Massachusetts and the region retain defense contracts while building up her foreign policy credentials, a key prerequisite for a White House bid. Warren said she intends to use her new post to work with Bay State military bases and defense companies to make sure their voices are heard. “Massachusetts is a hub for much of the defense research that helps us build a more secure future. I thought it was important that Massachusetts have a seat at the table so that’s why I worked hard to get the appointment to the armed services committee,” she said. Warren’s fund-raising for her 2018 race will be an early indication of whether she is seriously considering a presidential run, said Marsh, the Democratic strategist. The more her cash haul climbs above $50 million toward $75 million and above, “and where that money comes from, the grass-roots money from across the country, which she has the ability to raise, the more likely it is to me that she’s at least considering a next step,” said Marsh. Indeed, Warren’s announcement was very much pitched to her national audience and stressed her commitment to continue her role as a leading voice of Trump opposition and champion of populist causes. It also included a plea for small-dollar donations. She will be getting an early hand from the Progressive Change Campaign Committee. The group, which led the effort to draft her to run for the Senate in 2011, sent a fund-raising request from Warren out to its 1 million members across the country Friday. 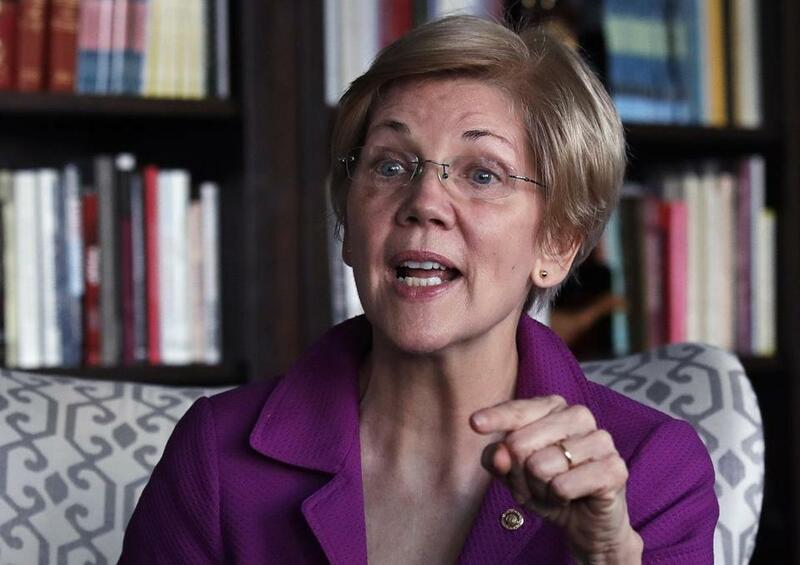 Warren ended September with about $4 million cash on hand, according to federal filings, a relatively small sum, especially considering the record-breaking $68 million she and opponent Scott Brown spent collectively in their brutal 2012 battle. Still, in the years since her election, Warren has proven herself to be one of the Democratic Party’s most prodigious fund-raisers. In her announcement, Warren also channeled the populist voice that has made her a key figure in the Democratic Party. Her announcement was instantly cheered by her fans, who posted messages of delight via social media. Some quickly seized on the idea that she was positioning herself to challenge Trump for the White House in 2020. In her interview with the Globe, Warren said she has not given any thought to that. “The only decision I’ve made is to run for reelection for the Senate,” she said.